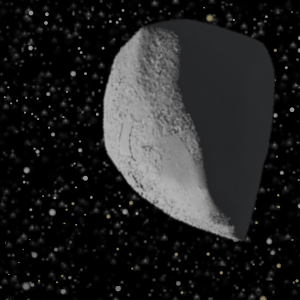 One of the earliest asteroids to be discovered, Egeria has a diameter of more than 200 kilometres. It orbits in the Asteroid Belt, but it follows an eccentric path that takes it millions of kilometres above and below the plane of the Solar System. Egeria is not spherical in shape, but instead has an irregular, elongated form. Its longest axis measures some 215km (or 133 miles), about a fifth the diameter of the largest asteroid, Ceres. 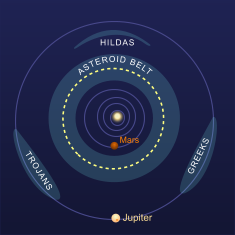 The orbit of Egeria within the Asteroid Belt between the orbits of Mars and Jupiter.